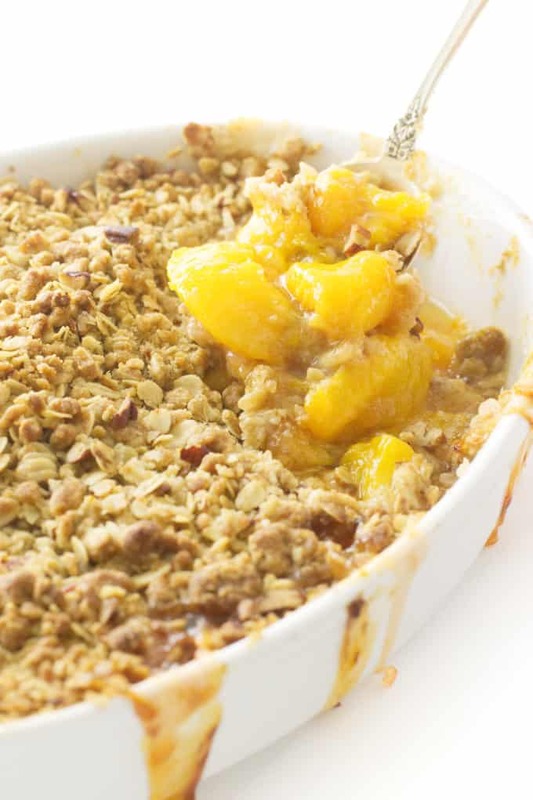 We can’t let the summer go by without baking this Easy Peach Crisp with Oatmeal Crumble. Sweet, juicy fresh peaches, a tangy bit of lemon juice, a grating of nutmeg and a buttery oatmeal topping. Pure bliss! These summer days are hot and steamy, much too warm to fire up the oven. We planned ahead to beat the heat and baked this easy peach crisp early in the morning while the day was still cool. Summer is filled with all manner of wonderfully delicious fresh fruit, including the peach! Peaches are in their prime season during July and August. Did you know that August is National Peach Month? Yep, and August 24th is National Peach Pie Day. 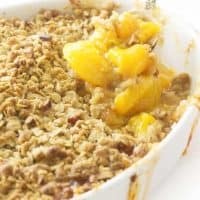 I do believe that this easy peach crisp with oatmeal crumble topping falls within that category. Warm peach crisp and vanilla ice cream! 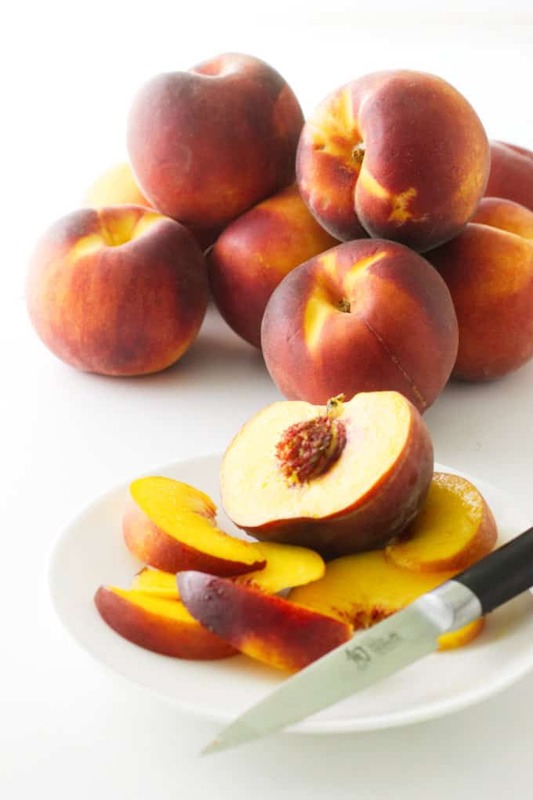 The white-fleshed peach is sweeter than the yellow-fleshed peach. Clingstone and Freestone are the most popular varieties. A medium peach will contain about 40 calories. Georgia is the official “Peach State”. A freshly picked peach will last about one week. The peach and the almond are related. Peaches….to peel or not to peel? Some folks like the peach skin left on when baking pies and cobblers. If you are in this group then just cut them in half, remove the pits and slice them up. However, they really are easy to peel. First, drop them into a hot water bath for ten seconds, then immediately into an ice water bath. The skins just slip right off. Cut the peach in half, remove the pit and slice them nice and thick. Sprinkle the tapioca, lemon zest, juice and almond extract over the peaches, toss to combine and let the mix sit to soften up the tapioca. 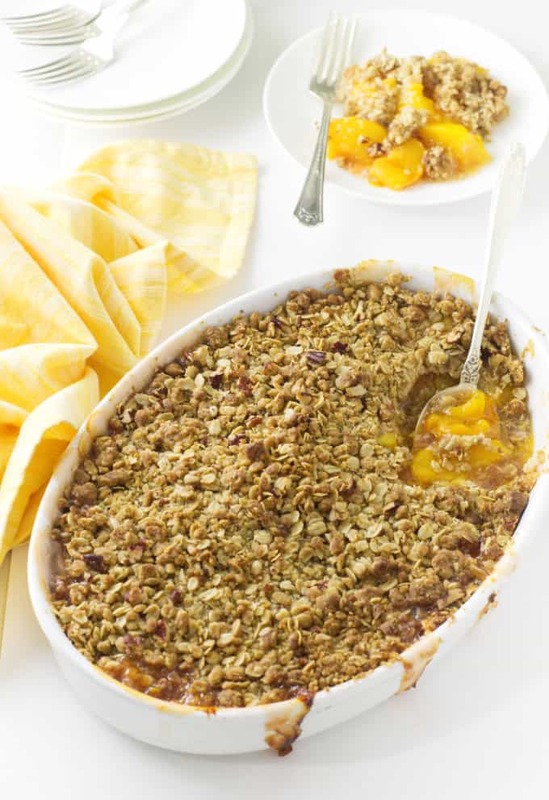 August is National Peach Month, celebrate with this Easy Peach Crisp with Oatmeal Crumble! Tapioca is a starch extracted from the cassava root. It is a thickening agent similar in texture to cornstarch. 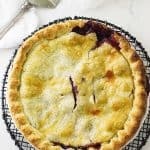 Fruit can be pretty juicy when baked into pies, cobblers, and crisps. They need some sort of thickener to bind them together. 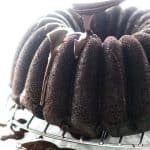 The most common thickeners are flour, cornstarch, and quick-cooking tapioca. 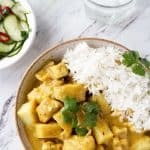 You can substitute one starch type for another but not equally. 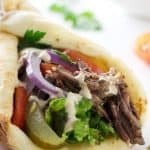 When replacing flour in a recipe, use half the amount of cornstarch or use two teaspoons of quick-cooking tapioca for every one tablespoon of flour. We prepared the topping by combining the oats, flour sugar, salt and a few gratings of nutmeg and chopped pecans. 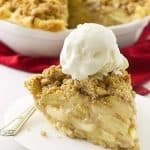 Butter is what gives this topping the crumble effect. We used a pastry blender to work the mixture to a crumbly consistency. If you do not have a pastry blender, two forks will do as well as a pastry blender. Fingers are great tools in cooking but not for this crumble as the heat from your fingers will soften the mix and make it oily. Sprinkle the topping over the peaches and bake the crisp until the top is golden brown and the juices are bubbly around the edges. What a way to celebrate National Peach Month than with a dish of warm peach crisp with a crunchy oatmeal topping and a cool scoop of vanilla ice cream! 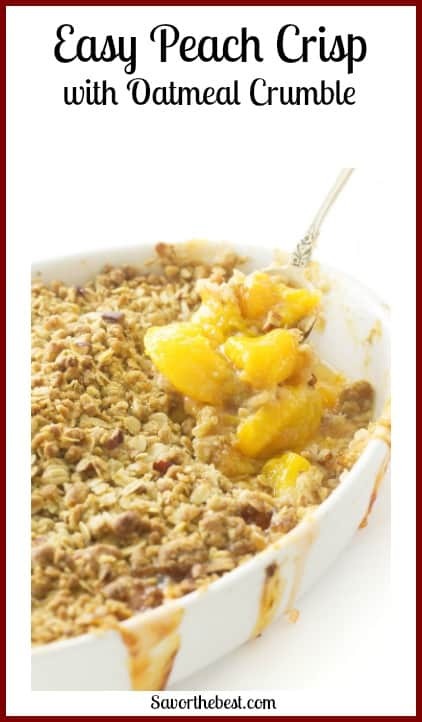 Have you made this easy peach crisp with oatmeal crumble? We would love to hear from you. Drop us a comment below. Or, if you snap a photo then hashtag it to #savorthebest on Instagram or Facebook. Celebrate the fuzzy peach! 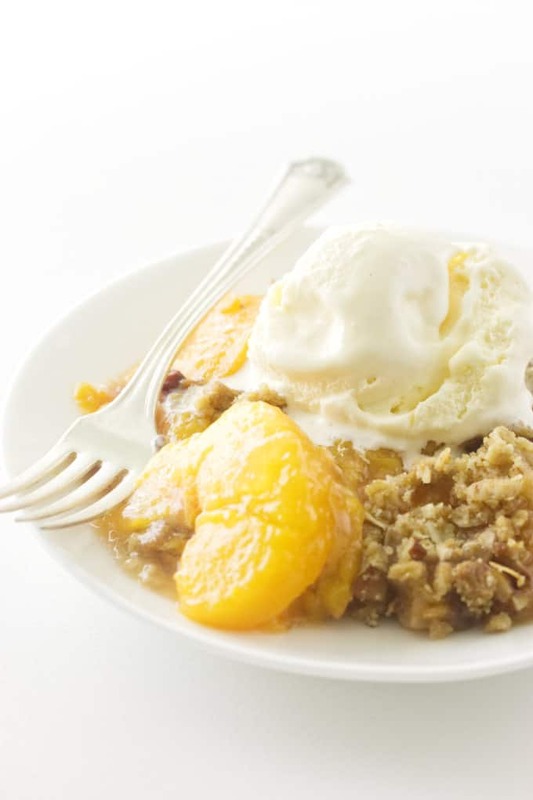 Bake this Easy Peach Crisp with Oatmeal Crumble. Sweet, juicy fresh peaches, a tangy bit of lemon juice, a grating of nutmeg and a buttery oatmeal topping. Pure bliss! In another bowl, add the oats, flour, brown sugar, salt, nutmeg and nuts. Combine thoroughly. 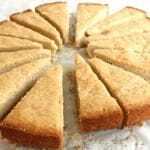 Using 2 forks or a pastry blender, incorporate the butter into the dry ingredients to a crumbly consistency. Set aside. Add the peaches to the prepared baking dish, sprinkle the topping evenly over the top of the peaches. Set the dish on the wire rack and transfer to the lower third of the preheated oven. Bake for 40-45 minutes or until the topping is lightly browned and the juices begin to bubble at the edges. Remove from the oven and allow to cool for 15 minutes. Serve with vanilla ice cream. Prepare the peaches for peeling by cutting an 'X' just thru the skin on the bottom of the peach. Bring a large pot of water to the boil, reduce the heat to low. Drop the peaches into the hot water, and scald for 10-15 seconds. Remove and place in an ice water bath. The skins will slip right off. Slice the peach by either cutting off wedges from the pit or slice the peach in half, remove the pit and slice into wedges. A baking sheet will catch any overflow drips keeping your oven clean. The wire cooling rack will allow for air-flow around the peach crisp and even baking. Love peach season! One of the best of the summer fruits. 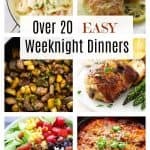 This is a great looking recipe — so many nice flavor elements showcasing the peaches. Crisps are always fun to make and eat — thanks!